Thank-you to everyone who participated in Tucker's Memorial Fund. After much prayer regarding where to spend the funds, we determined its purpose is to further the Gospel message. Tucker's Memorial Fund purchased 2,000 Award Bibles for the Good News Jail and Prison Ministry (www.goodnewsjail.org). These Bibles are leather bound and include a letter from Good News imprinted inside, along with a dedication page with Tucker's photo and a letter from our hearts. The inmates must complete a rigorous bible study, including homework that is turned in and then corrected. This program usually takes approximately one year to complete, and then they are awarded their bible: a cherished award, inside the walls of few possessions. 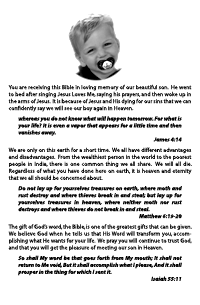 Please click on the image to see a full res version of Tucker's dedication page. People have inquired how to continue contributing to Tucker's Memorial Fund. 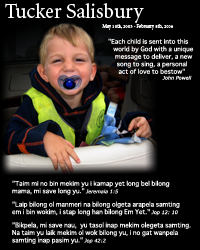 If you are interested, we ask you to please contribute funds to the above ministries (via links), in Tucker's Memory. With thankful hearts, Irv & Darci.